Entrance to Archaeological Ensemble: normal €15, reduced €7.5, groups €8. Entrance to each monument: normal €6, reduced €3, groups €4. Faced with the exceptional remains of the Roman past of Merida, it is impossible to stop admiring the grandeur of this city's architectural heritage, which was declared a World Heritage Site by UNESCO in 1993. The monuments that have survived show us what the public buildings of a Roman provincial capital were like. The Emperor Octavius Augustus founded the colony of Augusta Emerita in 25 BC, later becoming the capital of the Roman province of Lusitania. The city maintained its splendour during the Visigoth period, of which it also retains many traces, and during the Muslim period; these are some of the 29 parts of the city's Archaeological Ensemble. Visiting these monuments is easy, as most of them were within the walls of the Roman colony. 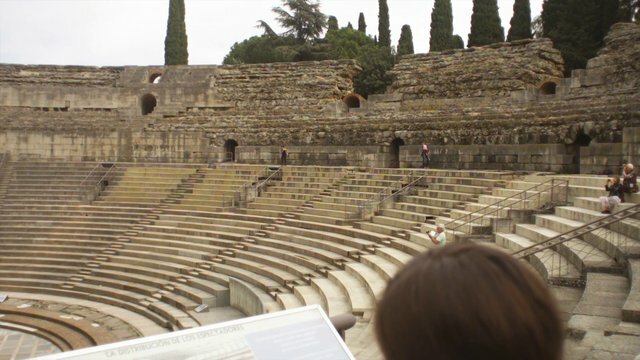 You have to visit the theatre, the amphitheatre, Santa Eulalia basilica and the Roman circus. And you must also visit Los Milagros aqueduct, the Temple of Diana, the Forum gateway, Trajan's Arch and Casa del Mitreo House, an example of a Roman home with its Cosmogonic Mosaic. There are a number of other sites that are outside the city's Roman walls, including the Cornalvo and Proserpina reservoirs, San Lázaro aqueduct, the bridge over the Guadiana river and the Alange baths. Although we do not know exactly when they were built, the famous public baths at Alange, 18 kilometres outside Mérida, are usually dated from the 3rd century AD. Two circular baths with domed roofs remain from the original Roman buildings. Historic information shows that the original baths also had a caldarium, or hot bath, steam baths and gardens. The basilica of Santa Eulalia in Mérida contains the remains of the Roman temple of Mars in its atrium, known as "el hornito".